The IPCC 5th Assessment Report (AR5) from 2013 shows the range of results that climate models produce for global warming. These are under a set of conditions which for simplicity is doubling CO2 in the atmosphere from pre-industrial levels. The 2xCO2 result. Also known as ECS or equilibrium climate sensitivity. The range is about 2-4ºC. That is, different models produce different results. Other lines of research have tried to assess the past from observations. Over the last 200 years we have some knowledge of changes in CO2 and other “greenhouse” gases, along with changes in aerosols (these usually cool the climate). We also have some knowledge of how the surface temperature has changed and how the oceans have warmed. From this data we can calculate ECS. This comes out at around 1.5-2ºC. Some people think there is a conflict, others think that it’s just the low end of the model results. But either way, the result of observations sounds much better than the result of models. The reason for preferring observations over models seems obvious – even though there is some uncertainty, the results are based on what actually happened rather than models with real physics but also fudge factors. The reason for preferring models over observations is less obvious but no less convincing – the climate is non-linear and the current state of the climate affects future warming. The climate in 1800 and 1900 was different from today. “Pattern effects”, as they have come to be known, probably matter a lot. And that leads me to a question or point or idea that has bothered me ever since I first started studying climate. Surely the patterns of warming and cooling, the patterns of rainfall, of storms matter hugely for calculating the future climate with more CO2. 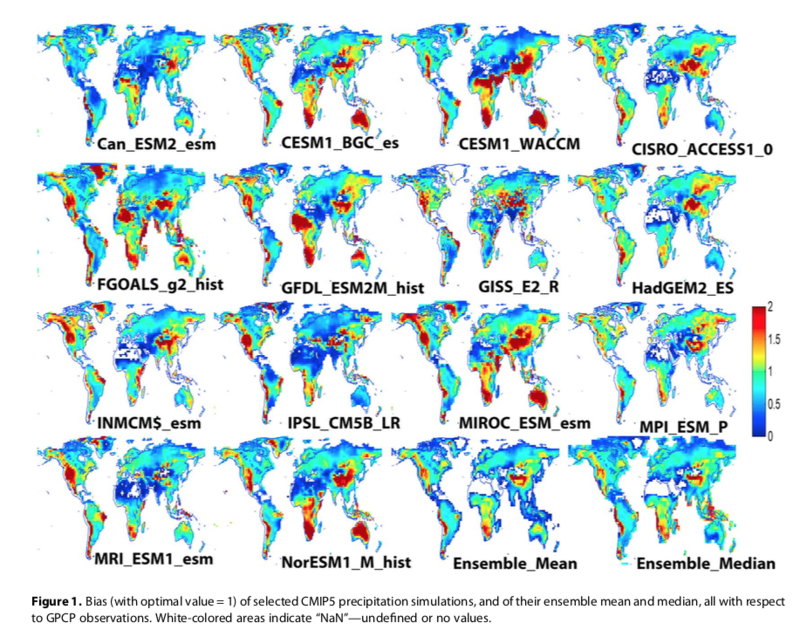 Yet climate models vary greatly from each other even on large regional scales. How much will global temperature rise if we double CO2 from pre-industrial levels? Based on current behaviour that’s roughly what we are on course to do by the end of the century (see 3 – How much CO2 will there be? And Activists in Disguise and 3.5 – Follow up to “How much CO2 will there be?”). For this we need a model. But to begin with we can use a much simpler model than a current GCM (global climate model). The key is to say “all other things remaining equal”. So we double CO2 but assume (in our model) that the vertical temperature structure of the atmosphere doesn’t change, clouds don’t change, water vapor doesn’t change, etc. This allows us to calculate how the radiation balance gets disturbed. Then we can find the new surface temperature which brings everything back into balance. We don’t need a GCM that attempts to model turbulent flows of the atmosphere and ocean. It turns out that the global temperature change will be about 1.2ºC from pre-industrial levels. This is with the absolute amount of water vapor staying the same. Water vapor is the strongest “greenhouse” gas in the atmosphere and the amount of water vapor is one key to understanding future climate change. If you stand next to the ocean in the tropics, barring a strong wind coming from inland, it’s pretty humid. If you stand next to the ocean in the Arctic it’s pretty dry. The reason is that the amount of water vapor that the air can hold depends strongly on temperature. Next to the ocean the air can be close to 100% relative humidity, but 100% relative humidity in the tropics has lots more water vapor than 100% in the Arctic. So a slightly different simulation has relative humidity staying constant. The result is some amplification from the water vapor. The Earth’s surface gets a little hotter, so there’s more water vapor – which is also a greenhouse gas – so the surface gets hotter still. In this experiment the global temperature change will be about 2.4ºC from pre-industrial levels. This second experiment is intuitively a better experiment than the first one – at least to get a “finger in the air” kind of result. It doesn’t mean it’s correct, but most people working in climate would expect relative humidity to be more likely to be constant than absolute humidity, when you increase the temperature. So, our “no feedback” result is 1.2ºC, and our slightly more realistic “some feedback” result is 2.4ºC (currently the global temperature has increased about 0.8ºC from pre-industrial levels). Both of these results can be obtained without relying on models that have “giant fudge factors” which is what you need to model the atmosphere and ocean “fluid flows” – see 6 – Climate Models, Consensus Myths and Fudge Factors. They only rely on being able to accurately calculate how radiation is absorbed and emitted by the atmosphere – an extremely well understood physics problem. (I can reproduce the results on my home computer using Matlab and the spectroscopic properties of CO2 and water vapor – see Visualizing Atmospheric Radiation). The real story, of course, is more complicated. However, to understand anthropogenic global warming (AGW) – a better name than “climate change” – it’s useful to know these results (first calculated in the late 1960s by Manabe & Wetherald) – and to understand the difference between simple radiation models and global climate models. Models are built on real physics (momentum, conservation of heat, conservation of mass) and giant fudge factors. Depending on the group I might hasten to add that “giant fudge factors” isn’t a nasty term, aimed at some nefarious activity of climate scientists. It’s just to paint a conceptual picture to people. If I said “sub-grid parameterization” I’m not sure the right mental picture would pop into peoples’ heads. I’m not sure any mental picture would pop into peoples’ heads. Instead, how do we change the subject and stop this nutter talking? In the least technical terms I can think of.. imagine that we divided the world up into a 3d grid. Our climate model has one (and only one) value in each cell for east-west winds, north-south winds, up-down winds, high cloud fraction, low cloud fraction, water vapor concentration.. basically everything you might think is important for determining climate. The grid dimensions, even with the latest and best supercomputers, is something like 100km x 100km x 1km (for height). So something like N-S winds, and E-W winds, might work quite well with large scale processes operating. But now think about clouds and rain. Especially in the tropics, it’s common to have strong upwards vertical winds (strong convection) over something like a few km x a few km, and to have slower downward winds over larger areas. So within one cell we have both up and down winds. How does the climate model deal with this? We also have water vapor condensing out in small areas, creating clouds, later turning into rain.. yet other places within our cell this is not happening. How does the model, which only allows one value for each parameter in each cell, deal with this? It uses “sub-grid parameterizations”. Sorry, it uses giant fudge factors. The problem is, when you create a fudge factor you are attempting to combine multiple processes operating over different ranges and different times and get some kind of average. In the world of non-linear physics (the real world), these can change radically with very slight changes to conditions. Your model isn’t picking any of this up. Here’s just one example from a climate science paper. It picks out one parameter in cloud microphysics, and uses three different values to run the climate model from 1860 to today and looks at the resulting temperature anomalies (see the last article 5 – Climate Models and Consensus Myths). Conversely, CM3c uses a more desirable value of 10.6μm but produces a very unrealistic 20th century temperature evolution. This might indicate the presence of compensating model errors. 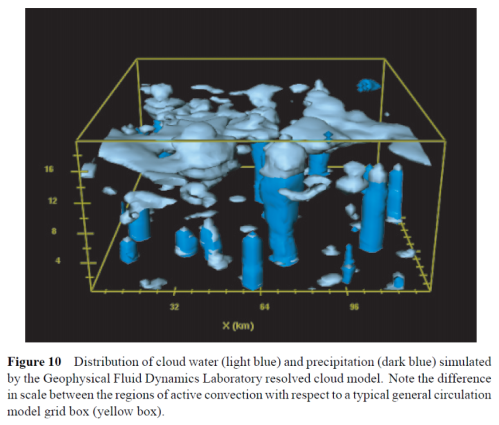 Recent advances in the use of satellite observations to evaluate warm rain processes [Suzuki et al., 2011; Wang et al., 2012] might help understand the nature of these compensating errors. (More about this paper in Models, On – and Off – the Catwalk – Part Five – More on Tuning & the Magic Behind the Scenes). This is the reality in climate models. They do include giant fudge factors (sub-grid parameterizations). The “right value” is not clear. Often when some clarity appears and a better “right value” does appear, it throws off some other aspects of the climate model. And anyway, there may not be a “right value” at all. This is well-known and well-understood in climate science, at least among those who work closely with models. What is not well-known or understood is what to do about it, or what this means for the results produced by climate models. At least, there isn’t any kind of consensus. In the last article – Opinions and Perspectives – 4 – Climate Models and Contrarian Myths – we looked at a few ideas that are common in many blogs but have no basis in reality. The title of this article “Consensus Myths” doesn’t refer to what you will find if you read a broad range of papers in climate science. It refers to popular myths put forward by those defending climate models. The reality is more complicated. While the contrarian myths are just plain ignorance of science, the consensus myths are closer to the truth, and more subtly misleading. While there are uncertainties with climate models, they successfully reproduce the past and have made predictions that have been subsequently confirmed by observations. A common argument heard is “scientists can’t even predict the weather next week – how can they predict the climate years from now”. This betrays a misunderstanding of the difference between weather, which is chaotic and unpredictable, and climate which is weather averaged out over time. While you can’t predict with certainty whether a coin will land heads or tails, you can predict the statistical results of a large number of coin tosses. In weather terms, you can’t predict the exact route a storm will take but the average temperature and precipitation over the whole region is the same regardless of the route. The bottom figure is the key. We can see the model and the observations match up on temperature anomalies. Clearly the author of that site has a point. Now we are looking at actual temperatures (rather than anomalies) reproduced by climate models. 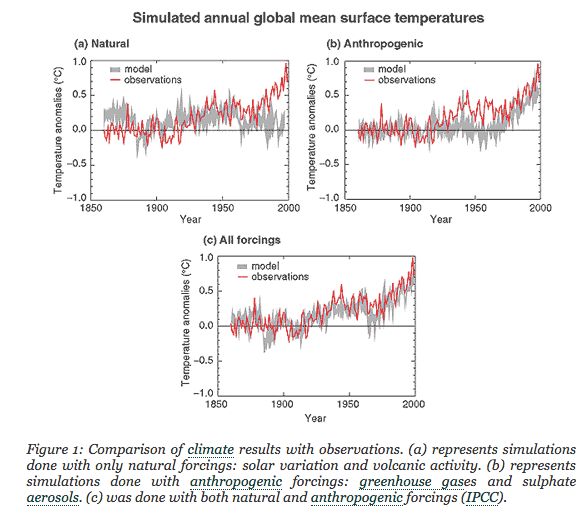 Climate models – reproducing the past – are running between 12.5ºC and 15.5ºC. A range of 3ºC. 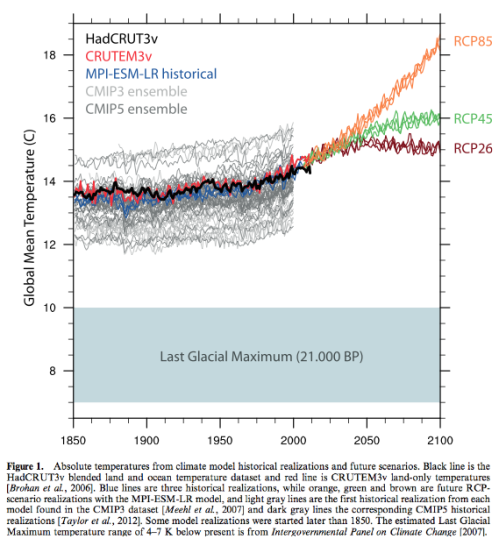 Why should we trust a model that runs 2ºC cold or a model that runs 1ºC hot? Should we? Shouldn’t we? Is this successfully reproducing the past? Here’s another example. I happen to live in Australia, not the country of my birth which is England, but it’s definitely the lucky country. Take a look at Australia (it’s bottom right for people confused by geography!). This graph shows rainfall simulated by different models over 25 years (1979-2005) compared with observations. I did try to access the complete datasets for myself but ran into problems. It’s possible that the scale 0-2 has just maxed on 2. I don’t know. Best case, some models have Australian rainfall at double the actual, some models have rainfall at 50% or less. Is this success? At best we can say that models do some things well and some things badly. 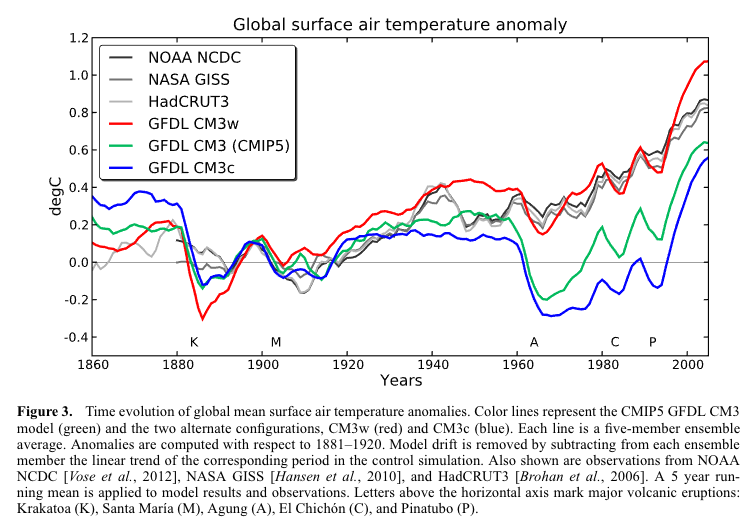 Just highlighting success in modeling past temperature anomalies is not the end of the story. Some confident souls might suggest that if they get past temperature anomalies right, then they will get future temperature anomalies right. For consideration in due course..
Now let’s look at item #2. Climate models don’t attempt to tell us the weather on a given day. They do attempt to tell us the average of weather over a period. On this, the website cited is correct. There is a large fly in the ointment unfortunately. It’s true that if you flip lots of coins you can predict the statistical outcome. Non-linear chaotic systems are a little different. There is an extremely simple chaotic system, described by the famous Edward Lorenz. He simplified a convection model with fluid being heated from the bottom into a system of 3 variables and looked at the results. The simple idea is that when you have a “deity-like view” (which means over a long enough time period) you can be confident that you know the statistics – the mean, the standard deviation and so on. But when you don’t have this deity-like view you can’t have any confidence in the statistics. You might watch the system over a “really long time” and calculate the statistics, but over twice that time, and 10x that time, the statistics may change. You don’t know how long you need to watch it for. More on this in the series Natural Variability and Chaos, especially Natural Variability and Chaos – Four – The Thirty Year Myth. The climate system is massively more complicated than the Lorenz 3-equation problem. No one has any idea how concepts from the “simple” Lorenz problem map to the complex problem. And the “simple” Lorenz problem is a gift that keeps on giving. The storytime edition of why we can trust climate models isn’t one you find very much in climate science papers. Instead the question is what we can learn from climate models. Relationship status with climate models – it’s complicated. Climate models are the best tools we have for estimating the future climate state. What will the world be like if we double the amount of CO2 in the atmosphere? 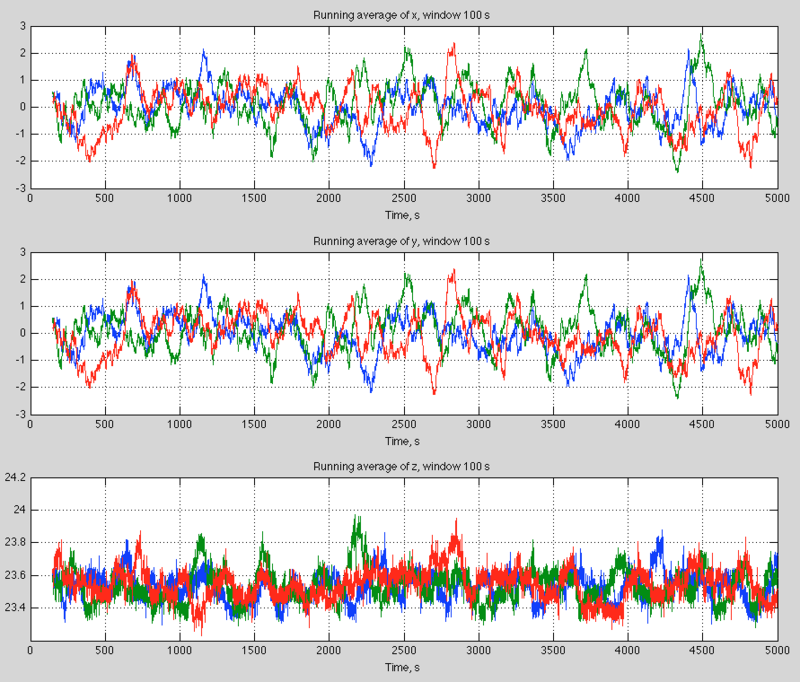 For a non-technical person, and this series is written for non-technical people, it’s hard to understand climate models. Should we trust them because climate scientists do? Do climate scientists trust them? What does “trust them” even mean? There are lots of papers written by climate scientists on the difficult subject of evaluating climate models. They do some things well. They do some things badly. Different models get different results. Sometimes widely different results. These are common themes. They have no basis in reality. If you learn climate science from people who have never read a paper on climate models, or never reviewed the equations used, or have no idea even what the right equations should be (this one is the most entertaining, covering 99.9%).. what can you expect? If you learn about outcomes of models from reading press releases produced by activists, faithfully reported by media stenographers – rather than reading tens of papers on model outputs for certain scenarios… how can you expect to know the range of results that are produced? How can you conclude that the worst case outcomes are always produced from models? It’s easy to prove these “skeptic” points wrong. If you understand the physics behind turbulence and heat transfer and read a technical paper on models you can easily see that models don’t have prescribed feedbacks or prescribed warming. On this site, in comments on previous articles I’ve shown the published model maths to people who think this, or have been taught this. No one has commented further. That’s a clue. Ignorance is bliss. If you can’t read Chinese, why would you think you can comment on the accuracy of Chinese to English translations? But there aren’t two sides to every story. Sometimes there’s only one. Sometimes there are 10. The choice isn’t “they are all garbage”, or “they are all trustworthy”. The story is complicated and I’ll try and explain more in future articles. Note to commenters – if you want to question the “greenhouse” effect post your comment in one of the many articles about that, e.g. The “Greenhouse” Effect Explained in Simple Terms. Comments placed here on the science basics will just be deleted. If you want to question model physics – the subject of this article – that is completely fine. I’ll be happy to provide the technical documents that describe the model maths. In the last article – Opinions and Perspectives – 3 – How much CO2 will there be? And Activists in Disguise – one commenter suggested that RCP8.5 was actually “business as usual” and put forward some comments. So I’m posting this followup to identify some key points in that scenario, before going onto the next topic. I’m trying to keep this series of articles brief and as non-technical as possible, but this one has to be a little more detailed. It was excellent to find someone prepared to defend RCP8.5 as “business as usual”. We need more champions of this idea so it can be discussed. What key climate scientists should do is publish a paper “Why RCP8.5 is actually business as usual“. Or “How RCP8.5 has a serious likelihood of becoming reality“. So it can be discussed out in the open. Science dies in the darkness. The brief for the astrologers and soothsayers – no I’m kidding, future forecasters – in preparing a set of scenarios, later the four RCPs, was to produce internally consistent storylines that covered the range of CO2 concentrations (and other GHGs) covered in climate science papers. ..A set of scenarios was developed to represent the range of driving forces and emissions in the scenario literature so as to reflect current understanding and knowledge about underlying uncertainties. They exclude only outlying “surprise” or “disaster” scenarios in the literature. Any scenario necessarily includes subjective elements and is open to various interpretations. Preferences for the scenarios presented here vary among users. No judgment is offered in this Report as to the preference for any of the scenarios and they are not assigned probabilities of occurrence, neither must they be interpreted as policy recommendations..
By design, the RCPs, as a set, cover the range of radiative forcing levels examined in the open literature and contain relevant information for climate model runs..
backward and colonially exploited China would be in the process of surpassing the UK’s economic output, eventually even that of all of Europe or the USA? the existence of a highly productive economy within a social welfare state in his home country Sweden would elevate the rural and urban poor to unimaginable levels of personal affluence, consumption, and free time? the complete obsolescence of the dominant technology cluster of the day-coal-fired steam engines? How he would have factored in the possibility of the emergence of new technologies, especially in view of Lord Kelvin’s sobering ‘conclusion’ of 1895 that “heavier-than-air flying machines are impossible”? For reasons of scenario parsimony, our set of three scenarios does not include a scenario that combines high emissions (and hence high climate change) with low vulnerability (e.g., as reflected in high per capita incomes). The A2 storyline describes a very heterogeneous world. Fertility patterns across regions converge only slowly, which results in continuously increasing global population. The resulting ‘high population growth’ scenario adopted here is with 12 billion by 2100, lower than the original ‘high population’ SRES scenario A2 (15 billion). This reflects the most recent consensus of demographic projections toward lower future population levels as a result of a more rapid recent decline in the fertility levels of developing countries. As in the A2 scenario, fertility patterns in our A2r scenario initially diverge as a result of an assumed delay in the demographic transition from high to low fertility levels in many developing countries. This delay could result both from a reorientation to traditional family values in the light of disappointed modernization expectations in this world of ‘fragmented regions’ and from economic pressures caused by low income per capita, in which large family size provides the only way of economic sustenance on the farm as well as in the city. Only after an initial period of delay (to 2030) are fertility levels assumed to converge slowly, but they show persistent patterns of heterogeneity from high (some developing regions, such as Africa) to low (such as in Europe). Economic development is primarily regionally oriented and per capita economic growth and technological change are more fragmented and slower than in other [scenarios]. Per capita GDP growth in our A2r scenario mirrors the theme of a ‘delayed fertility transition’ in terms that potentials for economic catch-up only become available once the demographic transition is re- assumed and a ‘demographic window of opportunity’ (favorable dependency ratios) opens (i.e., post-2030). As a result, in this scenario, ‘the poor stay poor’ (at least initially) and per capita income growth is the lowest among the scenarios explored and converges only extremely slowly, both internationally and regionally. The combination of high population with limited per capita income growth yields large internal and international migratory pressures for the poor who seek economic opportunities. Given the regionally fragmented characteristic of the A2 world, it is assumed that international migration is tightly controlled through cultural, legal, and economic barriers. Therefore, migratory pressures are primarily expressed through internal migration into cities. Consequently, this scenario assumes the highest levels of urbanization rates and largest income disparities, both within cities (e.g., between affluent districts and destitute ‘favelas’) and between urban and rural areas. Given the persistent heterogeneity in income levels and the large pressures to supply enough materials, energy, and food for a rapidly growing population, supply structures and prices of both commodities and services remain different across and within regions. This reflects differences in resource endowments, productivities, and regulatory priorities (e.g., for energy and food security). The more limited rates of technological change that result from the slower rates of both productivity and economic growth (reducing R&D as well as capital turnover rates) translates into lower improvements in resource efficiency across all sectors. This leads to high energy, food, and natural resources demands, and a corresponding expansion of agricultural lands and deforestation. The fragmented geopolitical nature of the scenario also results in a significant bottleneck for technology spillover effects and the international diffusion of advanced technologies. Energy supply is increasingly focused on low grade, regionally available resources (i.e., primarily coal), with post-fossil technologies (e.g., nuclear) only introduced in regions poorly endowed with resources. It is a very unlikely world where RCP8.5 becomes a reality. The total size of the world population is likely to increase from its current 7 billion to 8–10 billion by 2050. This uncertainty is because of unknown future fertility and mortality trends in different parts of the world. But the young age structure of the population and the fact that in much of Africa and Western Asia, fertility is still very high makes an increase by at least one more billion almost certain. Virtually, all the increase will happen in the developing world. For the second half of the century, population stabilization and the onset of a decline are likely. For people who don’t know much about development over the 20th century I very highly recommend The Great Escape, by Angus Deaton, Nobel Prize winner in Economics. He also covers the demographic transition. Some of the results of climate models for this “extremely high emissions scenario” (my term for it) contain very scary outcomes (I’ll be writing about climate models in this series). The difference in outcomes (as predicted by models) between RCP8.5 and RCP6 (a more likely “business as usual” scenario) should be highlighted. If policymakers and the public are concerned that we might reach 12bn population in 2100 with sub-Saharan Africa lighting up coal fired power stations by the thousands then there are some straightforward steps to take. I realise this last point goes against everything that climate activists believe in. But it seems like the rational response to the concern over RCP8.5 vs RCP6. Surely this is why these scenarios were developed – so we can make some attempt to assess the outcomes and costs of different possible futures?